There’s no denying the fact that having a golden bronze tan is aesthetically pleasing. However, is the benefit worth the health cost? A tan happens when the skin is damaged by ultraviolet (UV) rays. The skin goes into self-defence mode and produces more melanin which darkens the skin. There are two different types of UV rays – UV-A, which penetrate the deeper layers of skin, and UV-B, which penetrate the top layers and are the cause of sunburns. Both types of radiation damage the skin and can lead to skin cancer. The sun emits these UV rays with both helpful and harmful health effects. While the sun provides us with Vitamin D, it is also a known carcinogen (cancer-causing agent) due to its mutagenic effect. When cells become damaged from the radiation, in the form of a sunburn, they must reproduce to replace the damaged ones. This reproduction opens the doors to errors, or mutations, which can cause the cell to grow out of control and could become cancerous. “Using a tanning bed is safer than getting a tan from the sun” –MYTH! While this has been a common thought, in 2014 tanning beds were declared a carcinogen and listed as a class II device based on its health risks. 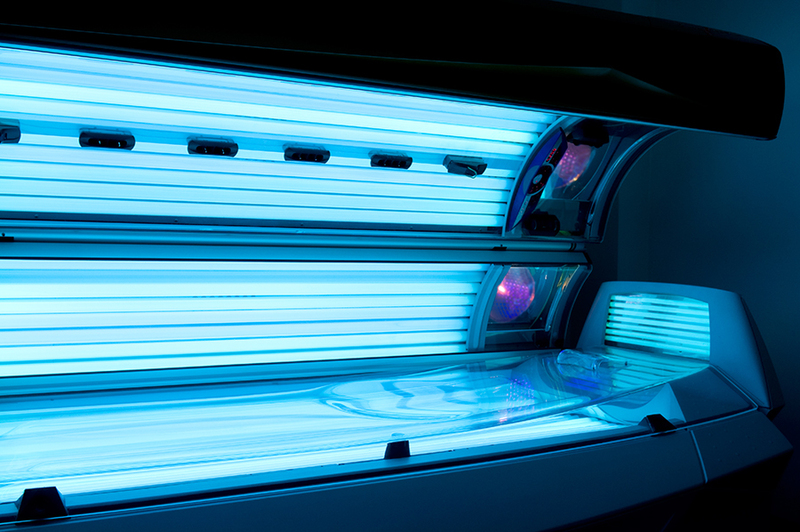 Tanning beds use lamps which emit both types of radiation, making them equally as harmful as the sun! Don’t be fooled into thinking it’s any safer to get a glow from a bed versus the great outdoors. In fact, people who have used indoor tanning facilities are almost 60% more likely to develop melanoma than someone who has never tanned indoors. The harmful effects of radiation add up over a lifespan, making it a large concern when tanning habits are started early in life. As protective measures, rules were put in place that tanning salons must follow. Primarily, users must be over the age of 18 years – requiring salon staff to ask for proof of age with government issued ID. 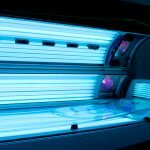 Additionally, staff must educate users on the dangers of tanning beds, post clear signage around the salon explaining the risks associated with indoor tanning, and ensure all users have proper eyewear before entering their tanning room. Vision damage, increased without the use of proper eye wear such as goggles or sunglasses with UV protection. Decreasing your immune system function leaving you more likely to get sick or develop skin cancer. Premature aging of your skin as it loses elasticity. This can lead to a leathery look down the road. 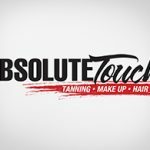 The bottom line – the next time you’re in need of a beautiful tan, book a spray tan and skip the bed! It’s better for your skin and your overall health.